We have been to New Zealand twice: the first trip we covered parts of the North and a few areas of the South Island — and didn’t feel like we’d seen nearly enough. Two years later we returned and spent two weeks in the South Island and this time we knew the ropes and decided to do things a little differently. We rented a Mauri camper van for travel and lodging, staying in motels only two times. The campgrounds were not crowded and featured nice bathrooms with showers, washers and dryers and hook ups for electricity and sewage as well. Oddly we did not see even one other American in the campgrounds! I make no apologies for the fact that I love lamb – lamb shanks, lamb stews, ground lamb, lamb chops, leg of lamb. 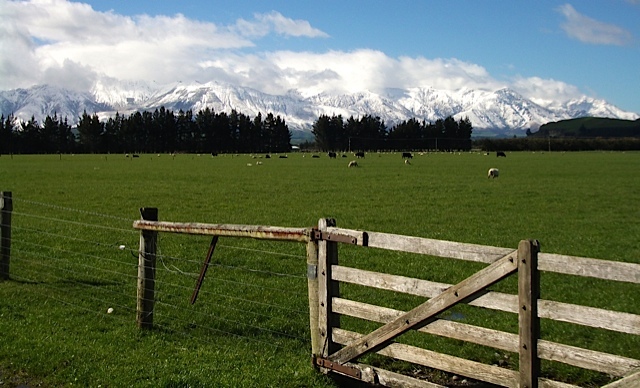 And New Zealand is the “Land of Sheep” – they are everywhere and so it made great sense that lamb shank was on the menu of every single pub we visited. I venture to say that during our trip we had lamb shanks at casual eateries at least five times a week. Each preparation was different but I cannot tell you that any of the dishes were less than wonderful. In New Zealand, shanks are traditionally served with various vegetables and a heap of mashed “kumara,” a term they use for sweet potatoes. Make these on a cold Sunday, and mash some sweet potatoes to soak up the savory juices. Roast some Brussels sprouts, green beans or brocollini and you will have a filling, beautiful plate of food. Invite some friends over, and pretend that these were very difficult and time consuming to prepare! You’ll be a star, I promise. Preheat oven to 425 degrees and put oven rack close to the bottom. Line a roasting pan with parchment paper (for easier clean up). Dry the shanks very thoroughly with a towel, then rub the shanks all over with the salt and pepper. Place in the roasting pan in the oven uncovered for about 40 minutes until shanks are a little browned. Remove and pour off fat at the bottom of the roasting pan (mine had about ½ cup of liquid I poured off). Turn oven down to 325 degrees. Sprinkle diced sundried tomatoes around the shanks – tucking them in so they are evenly distributed. Then mix together all the rest of the ingredients, then pour everything else over the shanks. Cover the roaster and keep cooking for three hours, basting every 45 minutes or so until they are fall-off-the-bone-tender. I often take the lid off the roasting pan 15 minutes before it is done so that the lamb browns a little more and the juices concentrate. Serve in a large bowl on top of a heap of mashed sweet potatoes and steamed or roasted vegetables around the lamb for color. In a pinch I have even used frozen veggies (a mix of corn, carrot and peas). 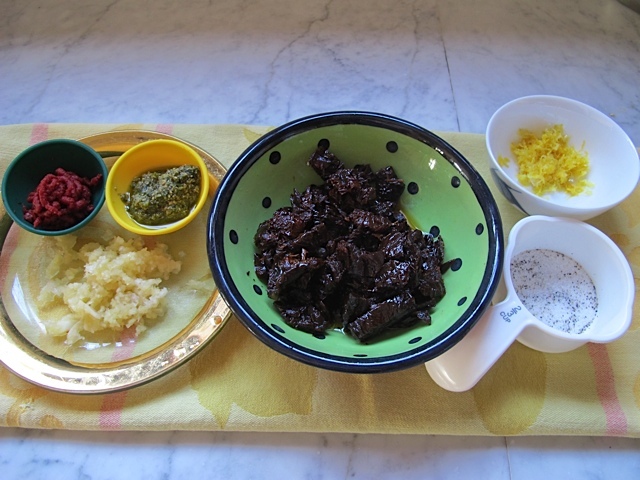 If making this ahead – and I often make the lamb the day prior to serving – the lamb fat can be removed then the lamb and liquid can be reheated in the roasting pan at 350 degrees for about 40 minutes. FYI, cooked lamb shanks freeze quite well in a little of the juice for up to 3 months. 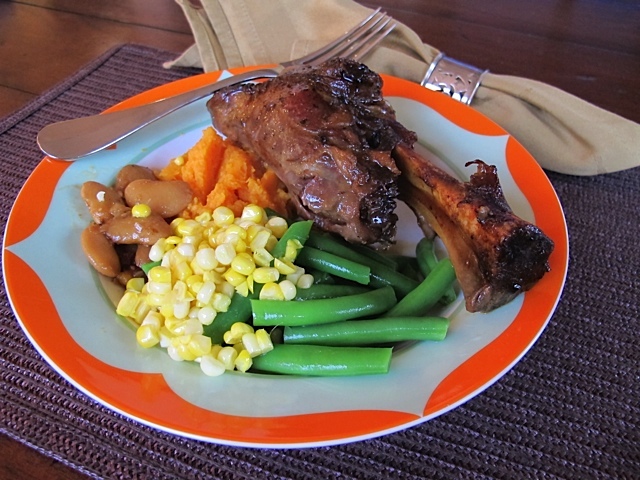 This entry was posted in Australia, Meat and tagged Lamb Shank, New Zealand. Bookmark the permalink. Great minds (and cooks) think alike 🙂 My blog post this week talks about our annual tradition of making Shepherd’s Pie, from scratch, with lamb shanks. Yum. I read your post, Beth and next time I make Sheherd’s pie I am going to try it with shanks rather than ground lamb. Happy New Year to your entire family! I hope all is well… These were the best lamb shanks I have ever had. Love your food blog. It is the best!!! !